Have you ever wanted to see a vision? Maybe you need to receive a message about the current situation you are in or guidance on a path to take or maybe you are simply curious about the future, no matter what the aim – this is the spell for you. I have tried this spell many times with varying results. I do encourage you to meditate daily (day and night) for the best results in this and in all of you magical practices. Try this spell and leave a comment about your experience. I believe in your power… UNLEASH it to the world. You will need to cleanse, charge and consecrate your scrying eye with the sea salt. If you have a crystal do this after sitting the ball in the sun. Mix very fine St. John’s Wort with the black paint and paint the back half of it. As you paint say the following chant: ‘Universe I am so thankful for all that I have (truly feel gratitude in your heart for something -big or small! ), thank you for blessing me with a clear and true vision -so mote it be!’. Allow the paint to dry fully under the light of the full moon. 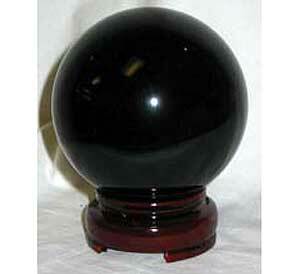 Once your scrying ball is dry, take the ball into a dark room and sit quietly in front of it. Stare deeply into the crystal while concentrating deeply on your question or request. Do this until your answer comes to you. NOTE: Don’t be discouraged if you aren’t powerful enough to see a clear vision. You may see flashes or letters or shapes… it will be up to you to decipher it. If you don’t get a clear answer you should monitor your dreams for the next 7 days… it will come.